Click on the logo below to share The Green Corridor on your status. 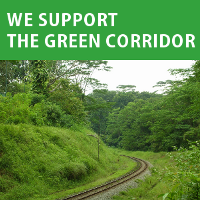 Click on the logo below to tweet about The Green Corridor. 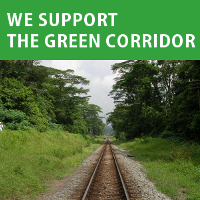 You may wish to use the hashtag #thegreencorridor in your tweets. Send an email to your friends and tell them about The Green Corridor. You may wish to use the info below as reference. Email now! Nature Society (Singapore) has submitted a proposal, The Green Corridor: A Proposal to Keep the Railway Lands as a Continous Green Corridor, to the government. NSS proposes to retain the current KTM Railway Land as a Green Corridor after the train operations cease on 1 Jul 2011. You can find out more about The Green Corridor at http://www.thegreencorridor.org and show your support by liking the page at http://www.facebook.com/thegreencorridor. Thank you. That’s all, your friends can simply click on the banner and come to our site. Thanks!